I love all of the food at this time of year! There is so much great comfort food that so many memories that go along with it. Now that I’m usually the one doing the cooking, I mix in family recipes with new favorites. One of our traditional desserts is bread pudding. My grandma made a great bread pudding, and since I’m such a carb-lover, it’s always been a favorite of mine. So, whenever we go out to eat, I order bread pudding for dessert if it’s on the menu. As much as I love bread pudding, though, they’re sometimes overly sweet. Between the super sweet bread and sauce, it can be way too much. 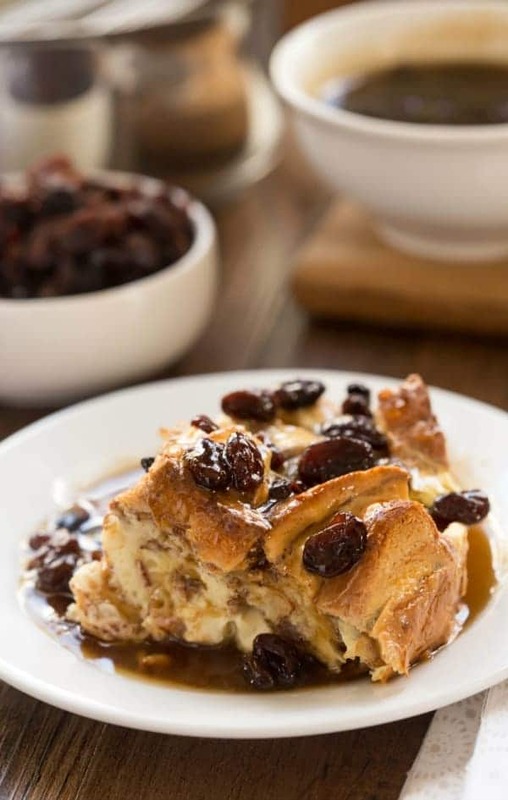 I tried to find more of a balance with this Cinnamon Swirl Bread Pudding with Maple Butter Rum Raisin Sauce. I left the sugar out of the bread pudding and found that no one missed it. 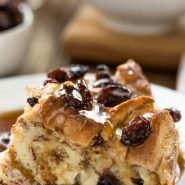 Between the plump, naturally sweet raisins and the maple syrup, the sauce was rich and buttery and sweet – the perfect complement to the creamy cinnamon bread pudding. 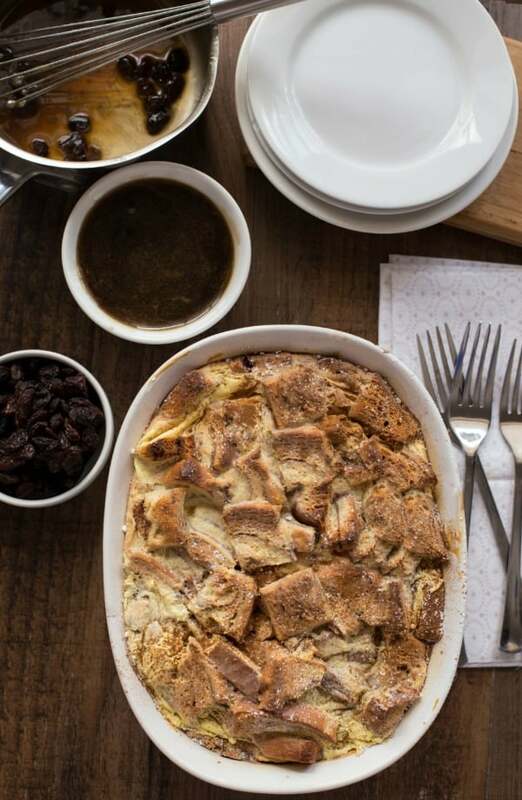 Plus, as far as comfort foods go, it’s hard to beat some warm bread pudding on a cold winter’s night – unless it’s with some cold bread pudding for breakfast in the morning! Seriously, if you’ve never eaten it cold, try it! It is incredible! For the bread pudding, preheat oven to 325 F.
Cut bread into cubes, and add to a baking dish. In a medium bowl, whisk together half and half, eggs, and vanilla extract. Let the bread stand for about 20 minutes to absorb some of the liquid. Bake for 45-55 minutes, or until done. If it starts to get too brown, tent with foil. To make the sauce, add maple syrup, raisins, butter, and rum extract to a small saucepan. Remove from heat, and stir in baking soda. 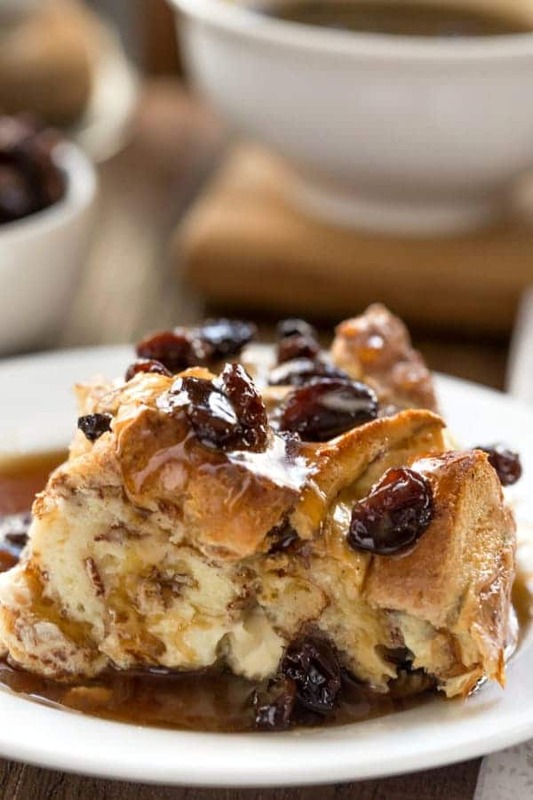 Serve bread pudding warm or cold topped with sauce. I have this in the oven right now! Made the butter rum sauce and we are anxious to try, after supper! ? Oh my, you can taste the flavors just by looking at your photos. This recipe looks like heaven! I adore bread pudding and I always make some around the holidays too. You have to add the California raisins or it’s not the same! Love this version with the maple syrup. Thanks for sharing!